I’ve showed you other ways to use this ruffle fabric……(here and here). Are you in love with this stuff like I am???? Well, this time, the project was for me……..and my gosh, this may be my favorite of all of my ruffle fabric uses. A perfectly ruffled maxi dress. However, I’m not a bare top/shoulder showing type of gal……..so give me a shrug and call it good. And this stretchy and airy fabric works all year round. 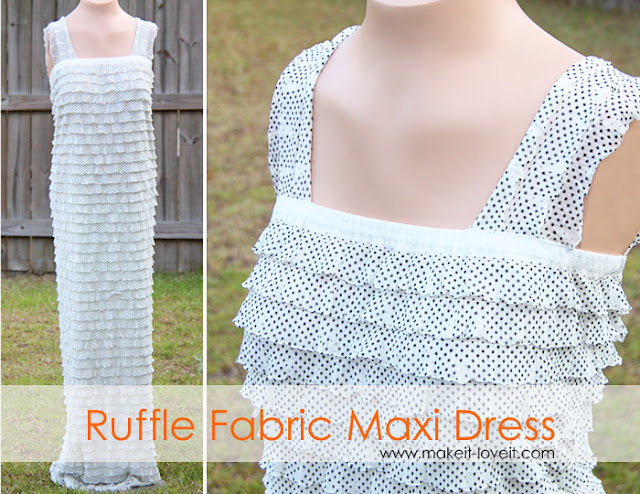 Would you like to make your own ruffly Maxi Dress? And my polka dot fabric can be found here. The ruffles are each 1 inch and was the perfect ruffle length for this dress, and still allowed the contour of the dress shape to show. Now cutting this dress shape is very forgiving…..so don’t stress. But you will pretty much be sewing a long piece of ruffle fabric into a tube. However, you want the top of the dress to be more narrow and snug, to give you some shape. So with the fabric folded in half lengthwise, cut a curved diagonal line from the top (where it will hit about your bust line) down to where you are at your biggest (most likely your hips). Make sure you have added about an extra 1-2 inches at the top, to create an elastic casing. Depending on your size, you may have to leave all of the width of the fabric…….or trim down the sides a bit. Just measure yourself around your bust, waist, and hips and determine how much fabric you want around you. I added a few inches to my measurements because I didn’t want it skin tight…..but still wanted it to contour my shape, from my waist up. Now, if you turn your dress right side out and have the seam going down the back, it should look like this: more narrow at the top and curved out until the hips……then straight down. **Now, try it on. If it needs to be taken in a bit more at some point……adjust your seam and trim off the extra fabric. I tried mine on and adjusted it about 3 times after taking the above picture. Since the fabric is stretchy, it’s hard to tell how it will fit exactly until you try it on. Now, with your tube right side out, trim off the very top ruffle (at the top of the dress), to give you more unruffled fabric to create a casing with. Trimming doesn’t have to be perfect but be careful not to cut through the main piece of fabric. Then fold over the top of the fabric 3/4 of an inch and sew in place……leaving a one inch opening nearthe back seam. Then thread a piece of 1/2 inch wide elastic, that will fit snugly right above your bust line (with a little extra length added for a seam allowance). Sew the elastic ends together, then sew the opening of the casing closed. Next, cut two long strips of 3 rows of the ruffles……long enough to fit over your shoulders and with some seam allowance added onto each end. Then attach each strap to the dress, making two seams along each end……one above the elastic and one below it. Try it on and see how it looks. Make any adjustments to the straps if necessary. Now wear it alone or match it up with a Tee….or your favorite shrug. And I can assure you……..you will adore the comfort of your new ruffled maxi dress. Oh I love the dress!! Oh my gosh I LOVE this! I want one :) I really really really need to learn to sew :)!! I've been working with this ruffled fabric all week making dresses for little girls. I love it! So fun and easy to work with. Just a note to everyone else…use a stretch stitch. Just lovely! I will have to make one for me! I'm tempted to to try one in a darker color but I better wait until I have a few less flaws in the middle to hide. Thank you for sharing. You looked so adorable at church and now I can make one all for myself! Love the dress…you make it look so (sew) simple! Do you think this would still look good for those of us who are plus size? I'm 5ft nothing and plus size, so I'm thinking it might be too many ruffles for me. But my daughter might get one of these. She (and I) loves ruffles! :) Thanks for sharing! This really is so pretty! Love the simplicity of this! Thanks so much for the tutorial and fabric store link! I love the dress, but I am thinking it might be a little too many ruffles for me:) hhhmmmm maybe my daughter. Thanks for the comment for larger sizes, some of us ladies are plumper. It is nice you even thought of us when sewing. I really need summer dresses and long means no shaving the legs unless you want to. Love it! I'm looking at the fabric right now to buy! :0) Thanks!! Any tips on making this with cap sleeves so you don't have to add another layer to an otherwise perfectly light & breezy dress? Thank you! It's darling! I LOVE this dress, I am definitely making it! I'm still slightly nervous about trying to make clothes that are supposed to actually fit. I'm stuck of soft toys and home furnishings at the moment. With the ruffled fabric I could probably err on the larger and it would look ok. Definitely something to try. I just love this dress! I wanted to let you know that I've given you the "One Lovely Blog" award! I want to see it on a real person! Such a cute dress. I think I will make one! Just looking at this photo I would never attempt but I am sooooo making this project this summer. oh my goodness, this is eye candy just looking at it!! I think I'll be attempting it. Love the ruffles and polka dots! Perfect for summer! Oh, I’m breastfeeding too……and because this stuff is stretchy…..I just pull it right down in the front. It’s kinda nice because then my back and belly aren’t showing from a lifted shirt. Make sense? Because, I have been in the mother’s lounge with a different dress all hiked up. Well, not in the mother’s lounge…..I was hiding in a locked classroom. Eeek! But yeah, no fun. Hi Ashley! I’m trying to order this fabric, but want to know how many yards you used. Just one? here’s my email heatherlholt@gmail.com Thanks! Love it, and would love to see it on a real person too! I second Brittany’s comment, but… with just a little extra sewing you could make a pull – up panel for nursing. The ruffles would hide the transition perfectly! Oooh, a panel would be really cool. Now that’s an idea. More sewing involved…..but cool idea!! I know, I know. The dress is better on. Well, maybe not better because that mannequin doesn’t have one chunky spot on her. Haha!! But, no one wants to see this post baby body so soon……and also, my 4 year old doesn’t take the best pictures of my projects. I need to have my husband take some…..but well, he’s away at school. One day, I’ll get better at the tripod and remote control thing. I am also wondering about this in a plus size gal. I love the ease of this dress and would make it in a heart beat if I wasn’t worried about my rolls showing! I will be using this material for my daughter for sure. I love this dress! The ruffles make it so cute. I haven’t seen the preruffled fabric yet, so thanks for sharing! Thank you!!!! I just bought my first ruffle fabric a few days ago! I was sitting down to search for some ruffle dress images for ideas but I checked my favorite blog posts first and saw this! This is PERFECT!!!!! I would love to make one of these with my new sewing machine! So, how many yards did you buy? I love it! I am kind of loving maxi dresses but not the jersey knit that hugs everything. Just wondering how much fabric did you need? It will depend on how much you need to go around you. This fabric was 50 inches wide so that was plenty to go around. So I bought 2 yards, and then had some left over. It depends on how tall you and how long you want it. My dress is about 60 inches tall and I had 72 inches (2 yards) to work with. If you need more than 50 inches around (make sure to include your hips), then you’ll need twice as much fabric and then you can sew the fabric together at the sides to make a bigger tube of fabric. This fabric was 50 inches wide so that was plenty to go around. So I bought 2 yards, and then had some left over. It depends on how tall you and how long you want it. My dress is about 60 inches tall and I had 72 inches (2 yards) to work with. If you need more than 50 inches around (make sure to include your hips), then you’ll need twice as much fabric and then you can sew the fabric together at the sides to make a bigger tube of fabric. Did you line your fabric? I just got mine in the mail (pink and white cascade) and it looks like it would be see through. If you didn’t line it do you wear some sort of slip with it? How simple! I have been wanting to make a few maxi dresses for myself, but have been too intimidated. This tutorial really helped. I can so do this! Thanks! Hi,I LOVE your website and I have made many things from here. I do have a quick question about this – when you say to cut out a diagonal shape so that the top half has some shape to it, you are only cutting one side correct? But then in the picutre where you show the shape after the sides are sewn together,BOTH sides have that curve to it. Does that mean that the seam is actually in the back and not to the side? A bit confused…it would be great if you can respond. Thank you!